Our Lady of Mount Carmel Catholic School offers school families a unique opportunity to raise funds for the school while also earning tuition credit dollars. With Food for Thought (also known as the Scrip program), families purchase gift cards for grocery stores, restaurants, retail stores, and more at the face value amount. OLMC School purchases the cards at a discount of 2-15%, resulting in revenue for each card purchased. OLMC School families earn 50% of the profit generated after they meet the $175 minimum profit amount per family. Many OLMC families significantly reduce their tuition expense by using gift cards for their everyday purchases and encouraging family members and friends to also purchase cards. You may purchase almost everything the store has to offer: Disallowed items include: stamps, lottery tickets, and money orders. 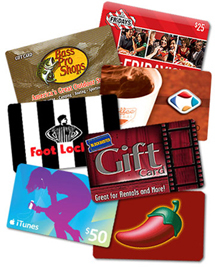 Restrictions apply when purchasing gift cards from in-store gift card malls. The profits support OLMC School. If you purchase scrip equaling $175 in profit for OLMC, you are now eligible for a rebate of 50 percent of any additional profit you accrue. Remember, you already spend this money. Rather than paying cash or writing a check to a store, use that same cash or check to purchase your gift cards in advance and redeem them at the participating stores and restaurants. It is a gift you can freely give to our school. All you have to do is a little planning, and we make the program very accessible so it's easy for you to participate! The vouchers are not valid with other promotions.